With the turn of the year, I often find myself making plans or setting goals for the coming year (but never resolutions–I don’t do resolutions). This year, other than some concrete reading goals, I find myself floundering a little more than usual. Maybe it’s just that I don’t have anything “big” to reach for this year, as I did with the Architectural Registration Exam last year. Or maybe I just haven’t put enough thought into it. But as it comes to knitting, I’ve decided I really need to focus on what I already have. So here, to refresh my memory, and perhaps shame me into finishing some things this year, I present my WIP parade. The first two knits are the newest of the bunch, but also the most urgently needed. Yes, we’re in January and I still don’t have a hat or mittens to wear. Thankfully, I haven’t had to go out that often, it hasn’t been cold more that a couple days, and I’ve been able to make do with some fingerless mitts and a non-matching scarf. 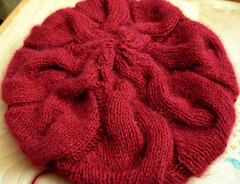 The hat is close–I just need to weave in ends and block it. I will also be knitting a Monkey Bread Scarf to match. Started this summer, and stagnated as I moved on to more urgent projects. 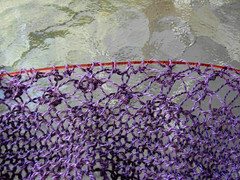 I was loving it though, so it will take priority after the winter knits are finished. Revived this summer, it also was abandoned in favor of other projects. I only have the edging left, so it’s close. I don’t want to think about how long it’s been since I last worked on this. 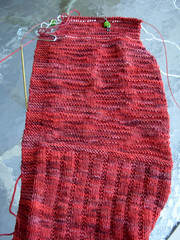 If I remember correctly, I was over 1/3 through the edging. I’ve just been too distracted by other projects. If you look at my Ravelry page, there are a couple other UFOs, but most likely they are all headed for the frog pond, either because the yarn doesn’t work, or I want it for a different project. And then there’s the yarn. I have a nicely sized stash. I haven’t added to it since May, excepting the yarn which went straight to projects, but I really shouldn’t have added to it then. 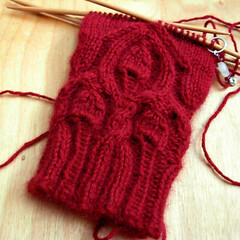 (At least not based on my current knitting rate.) I’d like to get to some of the yarns though, they’re so lovely. 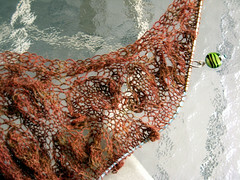 I have several sweater’s worth of yarn–which has already been designated for projects–and quite a bit of laceweight. 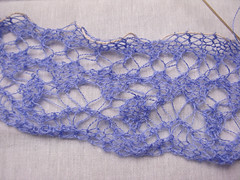 I also have a couple lace ideas percolating in my brain which I haven’t had a chance to get to yet. Chances are, I won’t get to everything this year, but it looks like I have plenty of knitting ahead!